Easter Stories is a collection of short stories written by a variety of authors, such as C.S. Lewis, Leo Tolstoy, and The Brothers Grimm. At 389 pages, it is beefy and makes for a wonderful read-aloud book with stories that have stood the test of time. These stories share the Christian meaning behind Easter in a captivating and engaging way. 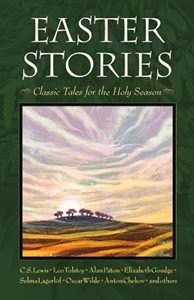 Illustrated with original woodcuts, and you can't go wrong with Easter Stories: Classic Tales for the Holy Season. We thoroughly enjoyed reading this book and bringing this review to you. Easter Stories includes time-honored favorites from world-famous storytellers such as C.S. Lewis, Leo Tolstoy, Selma Lagerlof, Oscar Wilde, Elizabeth Goudge, Maxim Gorky, Ruth Sawyer, Anton Chekhov, and Walter Wangerin – as well as many you’ve never heard before. Illustrated with original woodcuts. We really enjoyed this book. I used this with my son as a read-aloud book, bedtime stories, and I even had him read some of the stories and summarize for me. The stories are short, classic, and bring to light the true meaning of Easter. This will definitely be a mainstay in our home, brought out year after year to celebrate the Easter holiday. We LOVE it! Best of all, you can enter to win your own copy! Enter below! a Rafflecopter giveaway "Disclosure (in accordance with the FTC’s 16 CFR, Part 255: “Guides Concerning the Use of Endorsements and Testimonials in Advertising”): Many thanks to Propeller Consulting, LLC for providing this prize for the giveaway. Choice of winners and opinions are 100% my own and NOT influenced by monetary compensation. I did receive a sample of the product in exchange for this review and post.